When I wrote a review of Fire Emblem: Shadow Dragon for the Nintendo DS, I said I didn’t think I would ever play or review of the original version of the game. Well, it turns out I was wrong. I don’t want to repeat myself by reviewing an original after a remake, so you might want to go ahead and read my earlier review of the later game before you continue with this review. If that’s not needlessly complicated. Anyway, Fire Emblem: Shadow Dragon and the Blade of Light was the game which started off the Fire Emblem series. It stars Prince Marth, fighting against the odds to restore his fallen kingdom of Altea after it is invaded and overthrown by another nation. You do this through a hybrid of RPG and tactical gameplay. You control several different units on grid based levels and use them to fight off the enemy soldiers. But the thing is, all these units are individuals (no nameless pawns in your army) and they all have personalities and stories. Each level up and grow independently and if they die, that’s them out of the game. Something you’re sure to feel determined not to let happen, because you will feel very guilty every time it happens. It’s a fantastic formula. On the subject of the game’s difficulty, I actually didn’t find the first 50% to be all that hard. It may even have been easier than the remake. Enemies seemed to be defeated quite easily and didn’t do too much damage to me. But this turned around significantly towards the end. I have a little rule that I don’t review games unless I complete them and I’m actually kind of breaking that rule here: I got to the final boss and was fighting it, but the problem was that I couldn’t harm it because I hadn’t picked up some items several chapters before. I’d come so far and the game was unwinnable. I literally would have had to start my file again to see the end, even though I had invested so many hours. I ended up watching the ending on YouTube, but that was certainly a very disheartening feeling which no game has ever made me feel before! I am sure many people would find this very frustrating. But, ultimately, I don’t want to leave a bad impression of Fire Emblem: Shadow Dragon and the Blade of Light. I found it really satisfying when I was playing a level and the pieces finally fell together and I won. 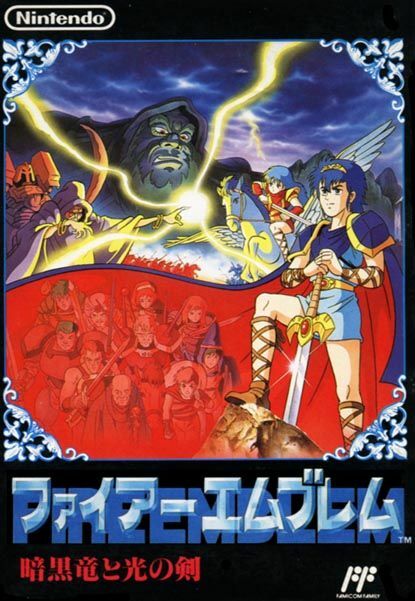 Though there wasn’t as much text and dialogue as you’d usually expect from Fire Emblem, I was impressed by how fleshed out and comprehensive this was for a Famicom game and, of course, I appreciate anything which portrays war as a horrible experience which results in the deaths of good honest people. It’s a very mature, anti-war stance. It may be primitive, but the qualities of the Fire Emblem franchise are all already there. Non-fans might not enjoy it that much, but if you love Fire Emblem I’d recommend giving this a quick look so that you can find out about the series origins. You might not want to play all the way through though (it is quite long) and, also, the DS remake is definitely a lot better.